Using just three basic gouache colours, one brush and watercolour paper, you will be shown exactly how to create these two beautiful paintings yourself. You will be given your FREE reference materials and be shown how to transfer these onto your paper. You don’t need to be able to draw! If you can draw already then all the better, but. if not, then this is not a hurdle for you. With these two DVD Videos you can learn directly from the artist himself in your own home, at your own pace and return again and again to these lessons to see precisely how to master the simple but proven techniques yourself. 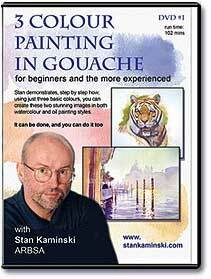 BOOK NOW AVAILABLE ‘Three Color Painting’ Create wonderful art using only three colours. To accompany the two DVD’s , in the book I explain how the principles shown in the DVD’s are used, step by step, to produce 20 paintings using watercolour and thick gouache techniques, in a variety of styles, loose impressionist and tighter illustration styles, subjects ranging from Venice, Landscape, Seascape, Transport, Wildlife and Pets to Portrait, using just three colours and white, explaining not just how to paint, but the thought process involved. Artists of every level will enjoy the improvement in their results! Please call 02476 421 235 or email info@stankaminski.com for further details.